I have a confession to make. 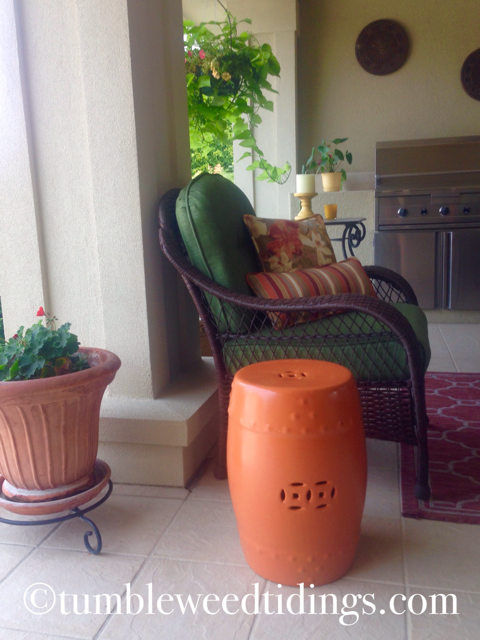 I’m kind of obsessed with ceramic garden stools and can’t really explain why. They aren’t that comfortable to sit on, but we now have four of them, collected over the years and scattered around the house. While they can make a nice perch when necessary, I find them more interesting as small tables to put in unexpected places. In addition to their function, they can also be used to add a nice pop of color. 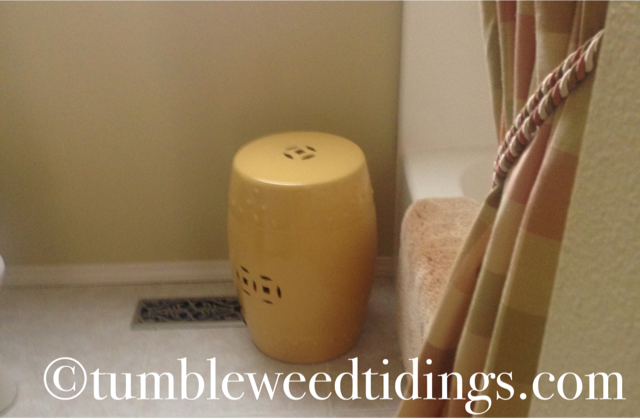 My first ceramic stool purchase, circa 1999, is a cream scrollwork variety that usually sits between two chairs as a place to set a cup of tea or a glass of wine. Through the magic of good movers, it has made it across the ocean and back without breakage. 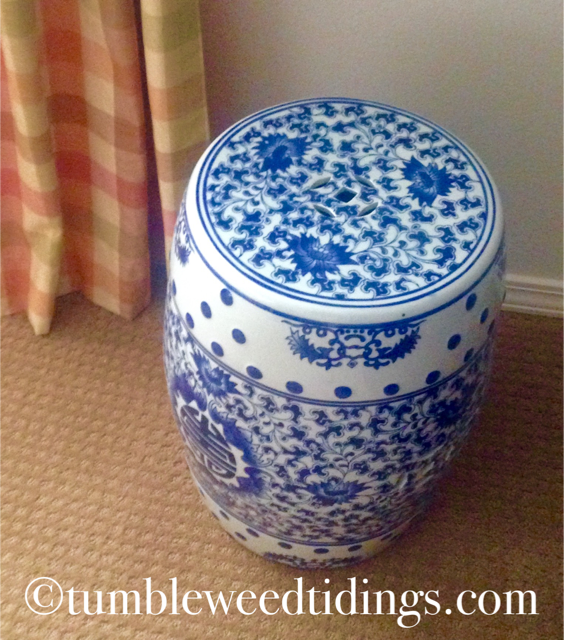 Then there is a blue and white Asian style stool that has moved from room to room over the years. It was purchased in Hawaii and is my personal favorite. Another one is bright yellow and was found at Costco several years ago. 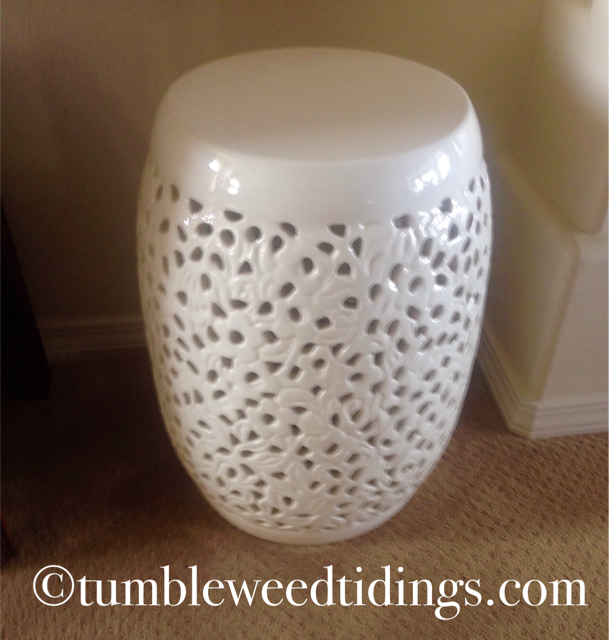 Each spring, I scour Costco for these garden stools, but I haven’t seen them since. At $39 each, this one was the most economical by far! 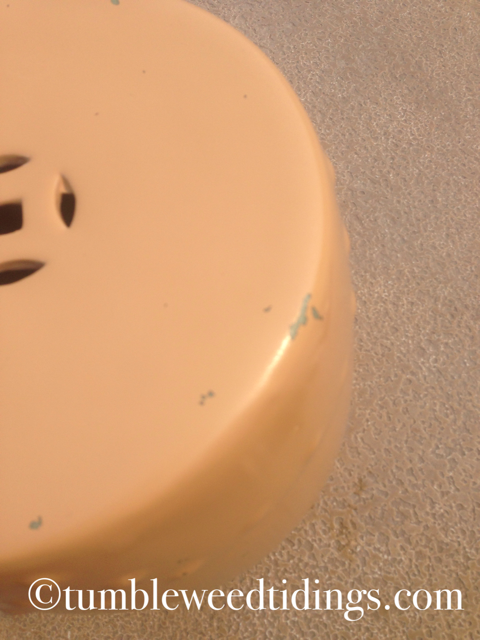 That brings us to the stool that is now on its third color evolution. First, it was verdigris, which matched the ironwork on our wall, gates, and other accents on our Hawaii house. When we moved back to Washington, it didn’t match anything on our patio, so I painted it gold. It has been that color for several years, but through wear and tear, the old verdigris was showing through and it just wasn’t living up to its full potential. 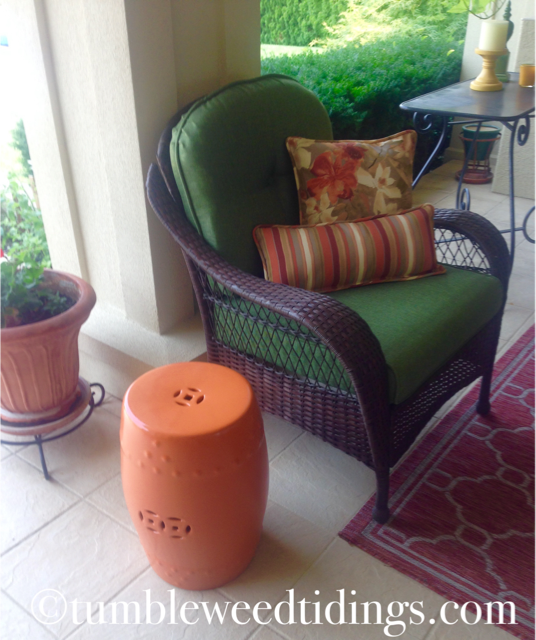 In search of my DIY weapon of choice, we went to Home Depot for spray paint and landed on Rustic Orange from Rust-Oleum, which goes well with our patio set. 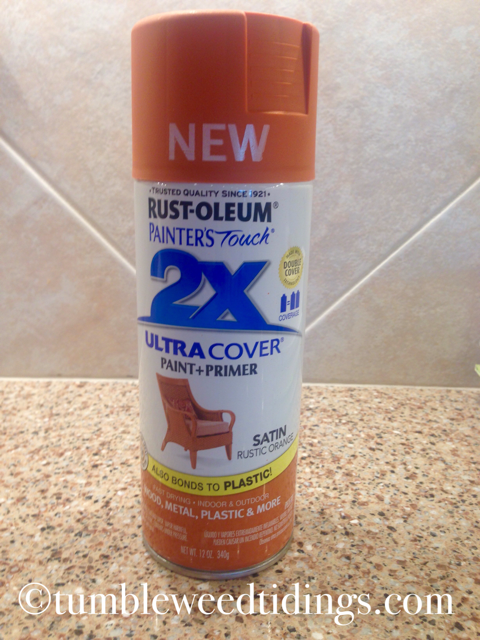 Since it says NEW on the lid, obviously Rust-Oleum thinks this is a hot color, as well! Before painting, I just cleaned the surface with a damp towel, let it dry, and began painting. The 2x coverage paint + primer is pretty amazing and even adheres to plastic, as well as wood and ceramic. Because it will be outdoors, I applied two coats. Okay, hello. 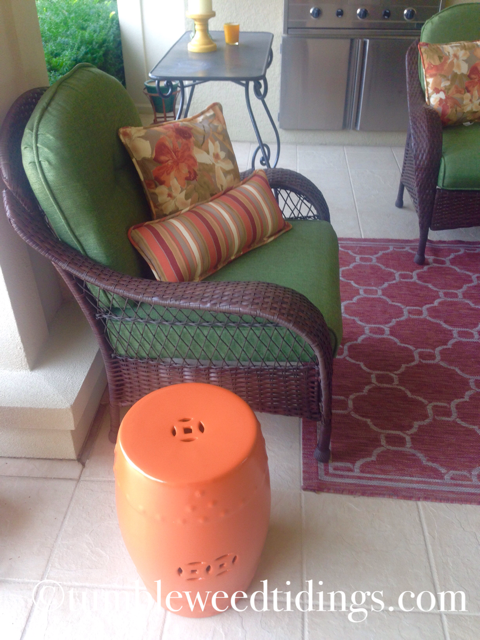 This new paint job has totally breathed new life into this stool and look how great it goes on the patio. It may even make a showing on the front porch when it’s time for fall decorating. 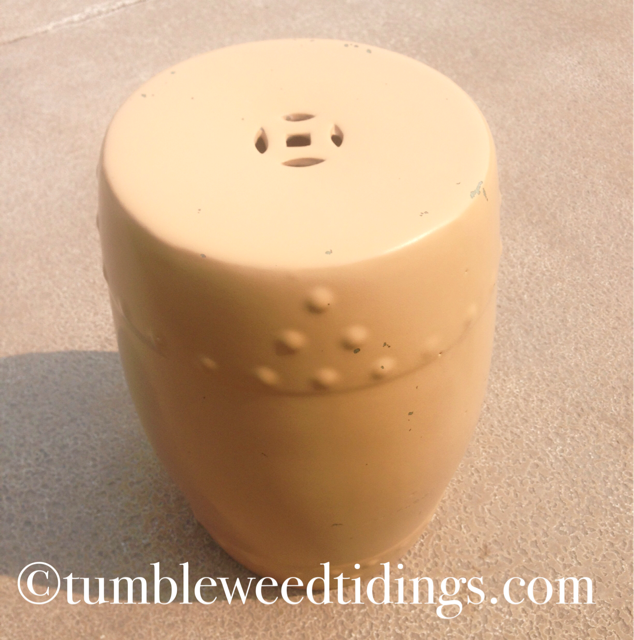 I think this could be one of the best under $5 DIY projects I’ve done lately. Hmmm, there is still almost half of the can left. 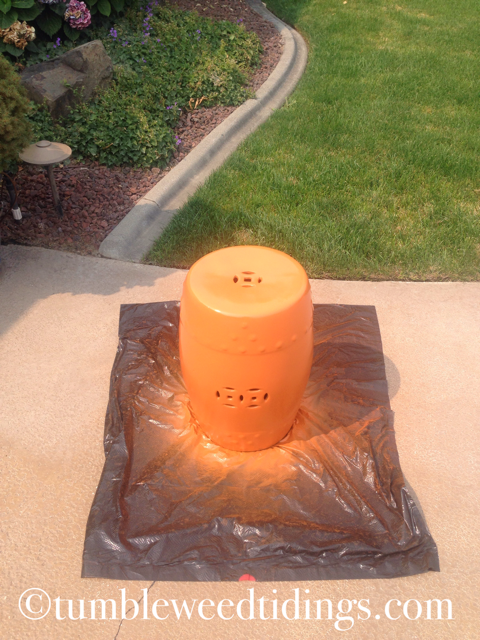 I wonder what else I can transform with Rustic Orange? Fall is coming, so I’m sure I can think of something!